With summer just about upon us (in name at least, anyway), we thought we'd take a look at some of our most popular seasonal sunflower bouquets. The sunflower is a type of flower which seems to have immediate connotations with the warmer months of the year, somehow managing to convey all the warmth and cheerfulness of a pleasant summer's day with its broad yellow head. The epitome of a summer flower, the sunflower is great for decorating your home and bringing some of the natural beauty of the great outdoors inside. If you have friends or loved ones with birthdays or anniversaries which fall over the summer months, a bouquet of sunflowers can really make for a magical gift. 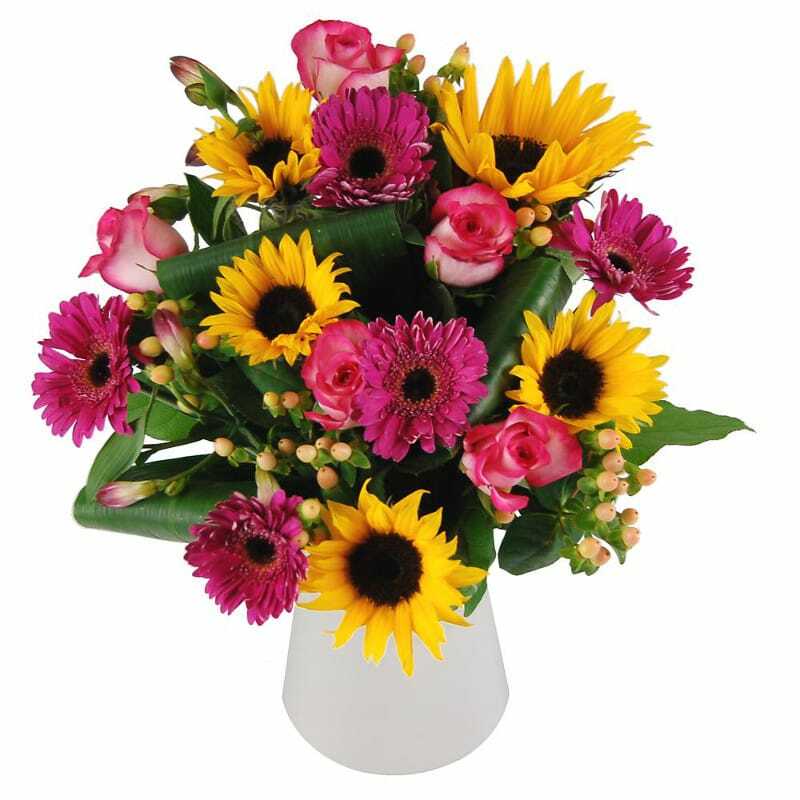 Clare Florist's Sunny Smiles Bouquet is an arragment which is overflowing with colour and vibrancy, thanks to the includion of sunflowers, germinis, roses and alstoroemeria. An explosion of pink and yellow hues, the Sunny Smiles Bouquet is certain to make any special occasion even more unforgettable. If you're after a bouquet which focuses more exclusively on sunflowers, Sunflower Surprise could be the one for you. Inspired by those long, lazy, relaxing summer days, Sunflower Surprise features sunflowers decorated with pretty red berries and fresh green foliage. Last but by no means least, our exquisite Summer Sunshine arrangement is a celebration for all things summery and cheerful. 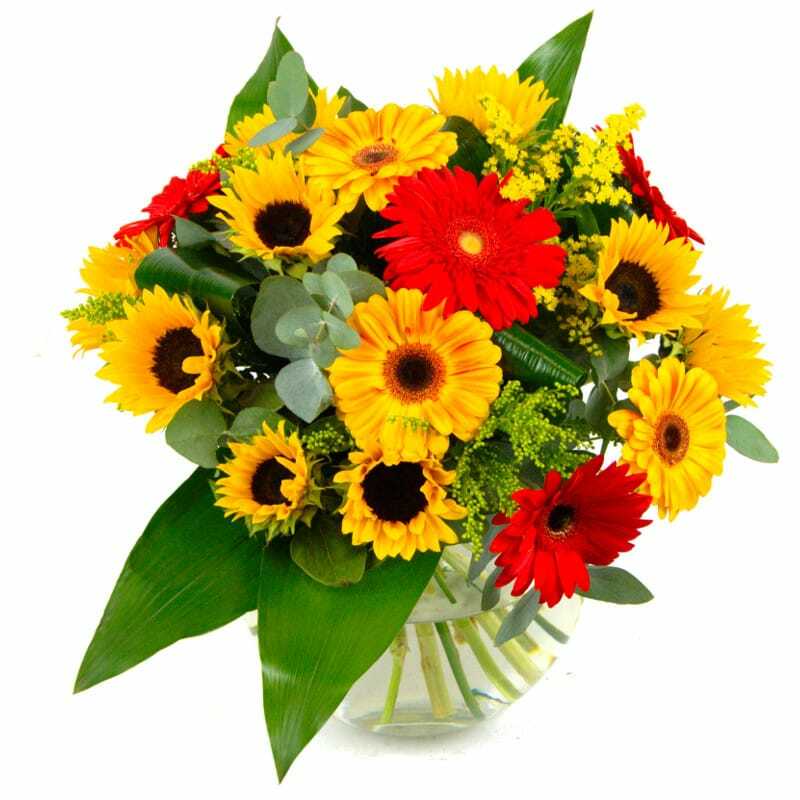 Featuring sunflowers, germinis, solidago and eucalyptus complemented by fresh green leaves, this beautiful bouquet is perfect as a gift for someonce celebrating good news, a birthday or any similar occasion over the months of June, July and August. 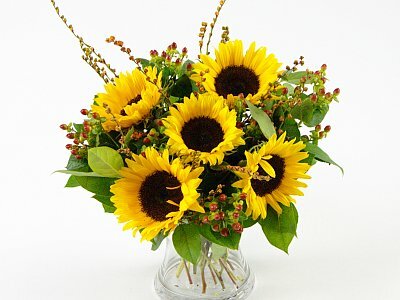 Let us know which of our summer sunflower arrangements is your favourite. Or perhaps you have an alternative favourite seasonal summer flowers?